Last week OPEN was told that the Secretary of State's reasons for allowing the Bishops Place development were confidential and that the balance of the public interest favours non-disclosure". Now, Boris's Greater London Authority tells us it is following that lead. OPEN has been told by the GLA that information leading to it approving the Bishops Place scheme is "commercially confidential" and " may need to be withheld...". 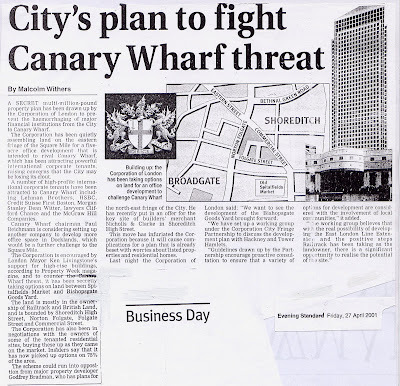 The confidential information is, we believe, the 'financial viability assessment', which the developer Hammerson gave the GLA on condition it would never be publically revealed, and which sought to justify an £11 million deduction in its contribution to off-site affordable housing. And, because it takes a long time time to remove all that information from the documents, "...it will be necessary to extend the time limit to respond" the GLA says. Our request was sent on 22 December and the time limit for providing the information would normally be 11 January (20 days). But the GLA says the limited information which they will allow us to see may now not be provided before 1 March - just 4 days before the time limit expires to challange the GLA's decision to approve the Bishops Place scheme. How convenient. For the GLA. And for Hackney. And for the developer Hammerson. What are the secrets of the Bishops Place planning decisions? There was certainly a lot of money involved - a £500 million private scheme, on a site mainly owned by Hackney Council, which was also the authority which granted planning permission, after the resignation of Hackney's former Head of Planning and after the developer had first vetted the Council report which went to the Planning Committee. Plus the promise of a £3.1 million payment for the GLA towards Crossrail into the bargain. After a long battle against the local residential and business community, after an historic building was saved, after family homes and £11 million for affordable housing in Dalston had been lost, now darkness decends as the reasons for the authorities' approvals are removed from the public's view. 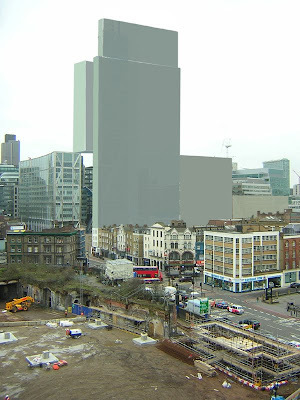 If Hammerson can raise the money to start building the 52-storey Bishops Place, before its planning permission lapses in 5 years, then Mammon will have secured its first major foothold in Shoreditch. It's attention will now move on to the other development sites locally which it, and the City Corporation, have spent years assembling. OPEN Dalston's appeal to the Secretary of State has been rejected for reasons which, we are told, "the balance of the public interest favours non-disclosure". We had appealed to the Secretary of State against the approval of Hammerson's Bishops Place planning application where it appeared that the authorities had abandoned their affordable housing and other policies. Hackney had granted planning permission for this £500million, 51-storey, tombstone scheme in Shoreditch. And agreed to reduce the developers contribution towards 'off-site' affordable housing from £14million to £3million. Hackney intended to take the 'off-site' money from Shoreditch and spend it in Dalston, thus robbing Peter to pay Paul. It would spend it on The Slab - the GLA's half of Dalston Square scheme - where, embarrassingly, there is so far to be no affordable housing at all. Following OPEN's appeal a reply was received from the Government's Office for London stating that "the application does not raise issues of more than local importance" and that the Secretary of State, Rt Hon. John Denham MP, would not intervene. "A small section of the case appraisal has been redacted (removed, concealed) The redactions are of the recommendations as to whether a case should be called in for public inquiry and the decision of the Secretary of State. We consider this advice and recommendations to be of a policy nature and subject to a qualified exemption..This is to allow free and frank thinking and consideration between officials and Ministers. Therefore, we consider that the balance of the public interest favours non-disclosure....Government Office aims to be as helpful as possible..."
OPEN Dalston had drawn a blank. The answers to OPEN's question, to be found in the government's appraisal, had been removed from public view. Apparently the officials' policy recommendations, and the Minister's reasons for his decision, are confidential internal communications. In the "public interest" they can be withheld from the public. So, no "free and frank thinking" will be permitted for the public then. Fortunately the BBC picked up the story from OPEN's blogs. It scrutinised all the documentation available, canvassed the authorities opinions, and then published the story here. The BBC, as well as OPEN, have asked for a review of the secrecy decision. We've been told it will be undertaken by a separate government department.